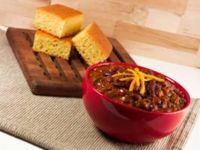 Beans & Cornbread is a fad named after the song Beans and Cornbread by Louis Jordan, which is used for the fad. The original site was created back in '06, with little impact. But in March '07, Max, who was about to create a similar site himself but found he had been beaten to it, improved the original instead. After these imposed edits, the site began to receive generous votes and views for a short period. Predictably, the site was taken by many as a racist joke at the expense of black people, when it was essentially a very simple YTMND combining the classic style of picture, sound and text coherently together with the catchy song. Consequently, the fad which spawned is often subject to stereotyping blacks for their supposed love of beans and cornbread, or some mixed variant created by a user. The fad also depicts people in blackface portraying them as racist. A picture of Al Jolson and pictures cut out from the original Beans and Cornbread YTMND are used. Beans and Cornbread initially did not pickup as a fad, even after the edits by Max. However, after the inclusion of the song on the YTMND soundtrack, and the eventual emergence of spinoffs, Beans and Cornbread evolved into a mini-fad. Most of the sites representing the small fad depicted racism and were poorly done. Many of the sites involved the photoshopping of Al Jolson from The Jazz Singer on random images with little or no edits to the sound. The fad was easily detested and faded out within days. Max himself would later add he was disappointed with the reaction to the site, stating he "couldn't agree more" with the accusation that the 'racism' gimmick ruined the wholesomeness of the site. This page was last modified on August 5, 2007, at 12:54.